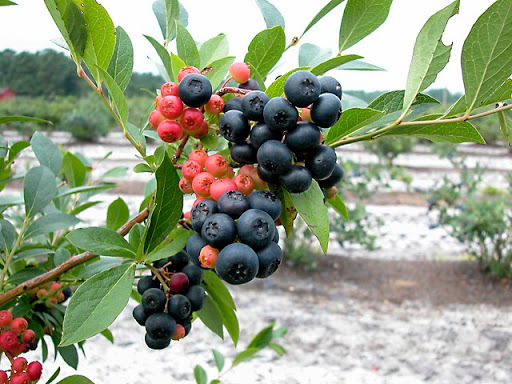 The new winter-hardy, black-fruited blueberry named Nocturne and developed by ARS. The U.S. Department of Agriculture (USDA) was recently awarded a patent for Nocturne, a blueberry cultivar developed by Agricultural Research Service (ARS) scientists at the Genetic Improvement of Fruits and Vegetables Laboratory. The new cultivar came from a blueberry cross made by ARS plant geneticist Mark Ehlenfeldt in 1993, and the plant was subsequently selected and evaluated from 1996 to 2011. Nocturne, tested under the name "US 1056," is a cross between US 874 (a mixed species hybrid) and Premier (a commercial rabbiteye blueberry). This cross incorporates germplasm from three different blueberry species, including one with extreme cold-hardiness. Nocturne is a vigorous, winter-hardy, black-fruited blueberry. This variety is intended to be a specialty market plant for home, landscape, and ornamental use, according to Ehlenfeldt. Nocturne is especially notable for having winter hardiness comparable to northern highbush blueberry cultivars and for being slow to break dormancy in spring, making it unlike any other rabbiteye blueberry hybrids currently available. The new blueberry bears fruit reliably in New Jersey, averaging 12 pounds per plant. Although, it is self-pollinating, yields and size are likely to be improved by cross-pollination. Unripe fruit is vivid and red-orange, providing attractive landscape interest. Ripe fruit is black, sweet and medium-sized, with a flavor atypical of either rabbiteye or highbush blueberries. Fruit ripens in late midseason to late season. The scar quality-how cleanly the fruit separates from the stem-is fair, and the fruit has only moderate firmness, so Nocturne is not recommended for storage or shipping. Nocturne plants may be available to growers within a year or two.